APO 810 operated in Iceland at Baldurshagi 27 July 1941 through 29 April 1942 (per Facit 1995-96). Watch for the different styles and types of the postmarks, including the center date/time information and the location of the APO number in the postmark. The different numbers, styles, and colors of the censorship handstamps are also collected. All items (as well as others that are not yet listed) are available for viewing on approval. Please request approvals. APO 810 (Baldurshagi) machine cancel "8 - AM / APR 24 / 1942" with the 810 at the bottom of the circle. Sent "free" only five days before APO 5 ceased operation in Iceland; it operated for less than a year in Iceland. Self-censored by a major with the "Hdqts 2ND INF", with greenish blue round #60 censor handstamp. The return address states "ICELAND" which certainly must have been against regulations. Scarce machine cancellation. APO 810 (Baldurshagi) machine cancel "FEB 26 / 9 - AM / 1942", with the A.P.O. 810 at the bottom of the circle, AMERICAN BASE FORCES. This APO operated for less than a year in Iceland. 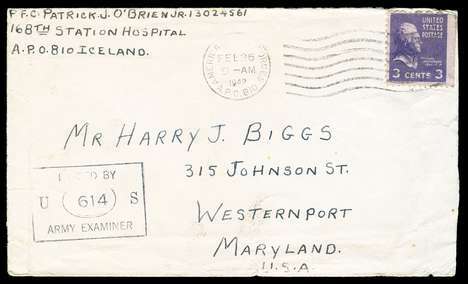 Sent by a PFC with "168th Station Hospital" and with a black rectangular #614 "racetrack" censor handstamp. Franked with 3 cents Prexie (booklet stamp) postage, but I believe should have been free. The return address states "Iceland" which certainly must have been against regulations, but I have seen similar examples from this APO at this time. Scarce machine cancellation. 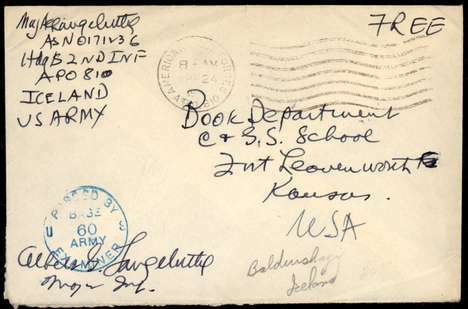 APO 810 (Baldurshagi) return address on a cover send by a serviceman, to himself, using the Icelandic post office. 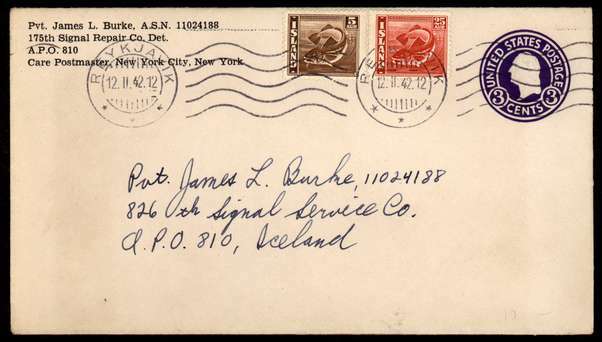 Franked with Iceland Scott #219 and 224 on a U.S. 3 cent postal stationery envelope. The letter inside (which must have originally been in an outer envelope) requests the Icelandic post office to cancel the envelope and to send it to him and for the APO post office to cancel it as well. An interesting example of a enterprising philatelist trying to make an interesting cover.